More than 50 residents attended public hearing at main airport terminal Wednesday. Treatment systems will be installed, bottled water will be provided and an investigation into the contamination of private wells from firefighting foam remains ongoing, an environmental consultant for the Martha’s Vineyard Airport told a packed public hearing this week. 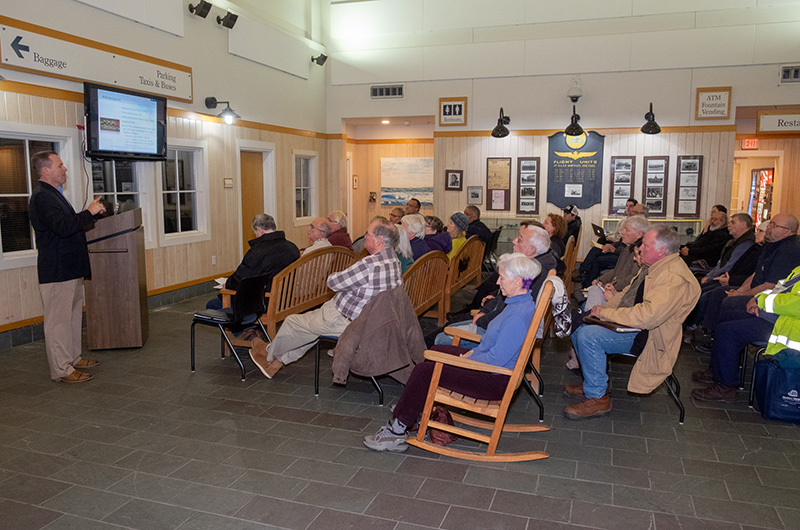 “We’re in for the long game,” said Ron Myrick, director of remediation for Tetra Tech, speaking to airport leaders and more than 50 area residents in the airport terminal Wednesday afternoon. Tetra Tech was hired by the airport late last year to investigate the discovery of Per and Polyfluoroalkyl (PFAS) contaminants in private wells south of the airport. PFAS is found in firefighting foam and can be harmful to human health if ingested through drinking water. State and federal guidelines for safe limits of PFAS are in the early stages of development, but the Massachusetts Department of Environmental Protection has set safe limits at 70 parts per trillion. A report filed by Tetra Tech in early January said 13 private wells among 96 that were tested south of the airport contained elevated levels of PFAS. Six of the wells were identified as posing an immediate health hazard. At the hearing Wednesday, Mr. Myrick said beginning in February, point of entry (POE) water treatment systems and bottled water will be provided to 26 homes with wells containing PFAS concentrations above 20 parts per trillion. The point of entry systems can quickly and dramatically reduce PFAS levels, Mr. Myrick said. For example, he said one system installed for a well tested in December that showed a PFAS concentration of 1,159 parts per trillion, saw the number drop to less than two parts per trillion with the installation of a POE system. “Point of entry systems could last quite awhile until everything is remediated in the aquifer,” the consultant said. The systems cost about $4,000 apiece. The airport will pay for installation and monitoring. The affected private wells lie primarily along Coffins Field Road, Waldron’s Bottom Road and Vineyard Meadow Farms Road, the Tetra Tech report found, with the highest concentrations of PFAS turning up closest to the Edgartown-West Tisbury Road. Concerned residents peppered Mr. Myrick with questions. “Our house has been tested . . .we’re okay but the home next to us is not. How often do you plan on retesting?” asked Lori Ionnitio. Felicity Russell asked whether contaminants may have reached the water table, threatening the Island aquifer. Mr. Myrick said that is currently unclear, and he echoed the broader concern. 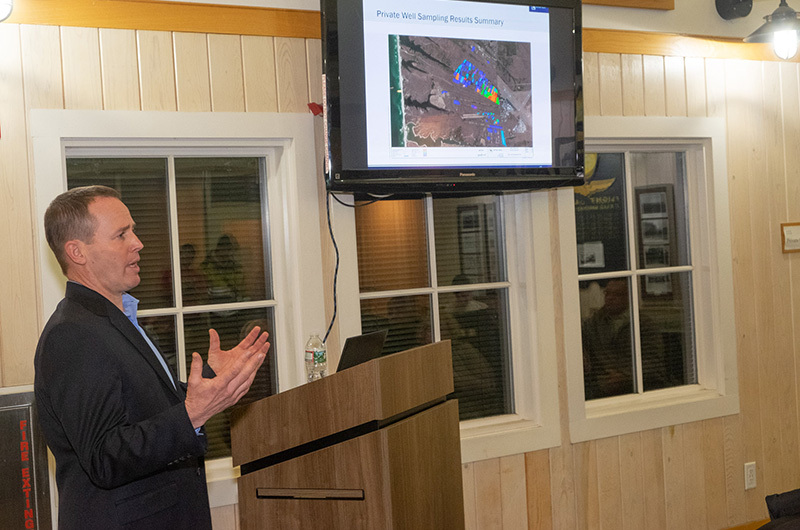 He said Tetra Tech plans to install a stratified monitoring well near the Edgartown-West Tisbury Road that can measure PFAS levels at different depths underground. In the longer term, he said because PFAS contamination is a relatively new issue and in the early stages of study, including at many airports around the country, more research and monitoring is needed before a mitigation plan can be developed. Edgartown water superintendent Bill Chapman praised the airport’s quick response to the PFAS issue. Mr. Myrick said Tetra Tech will file monthly status reports with the state DEP and provide regular updates on the investigation at upcoming meetings of the airport commission. He encouraged residents to contact him with questions or concerns at ron.myrick@tetratech.com. “We have a static shot of what it looks like now. We need to continue to follow up and make sure things don’t change,” he said. It'd not rocket science, all they have to do is take a water sample from the houses and if it has foam residue then BINGO they contaminated that persons well and they are responsible to fix it or put in whole house filtration systems for all the contaminated houses. This situation needs to be monitored closely as it appears the Airport Commission is doing so far. In a recent article regarding the proposed expansion plans the Commission began to make noise regarding the " high costs "of this contamination and remediation. It seems so far that Tetratech has been able to identify localized contamination and has an effective system to use. However, my concern as expressed in the meeting by Felicity Russell, is the possibility of contaminants leaching into the sole source aquifer and spreading to other wells around the island. I believe that this need to be thoroughly examined and satisfactorily concluded before any expansion of the airport can be seriously considered.